With the ringing in of a new year and the ups and downs of the cattle cycle, it’s reassuring to have a tool in the cattle feeding business that will help decrease costs and minimize health risks to calves during one of the most stressful times of their lives. With three simple steps and just pennies per day, cattle feeders can take a proactive approach to keeping their calves healthy while helping them increase their profit potential. 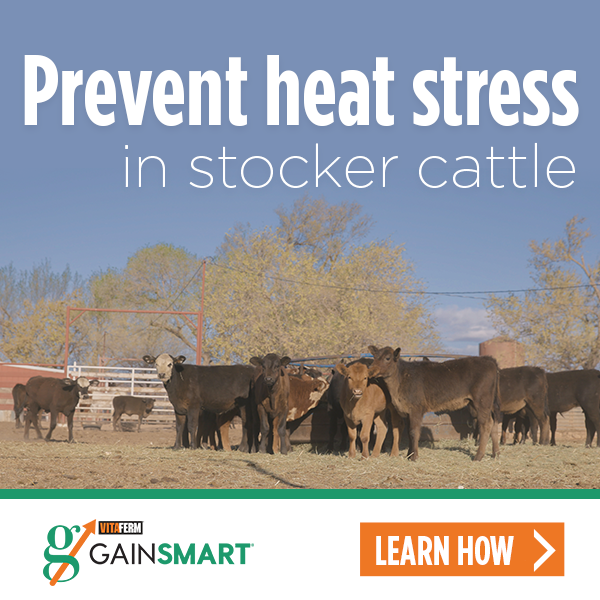 The VitaFerm® Gain Smart® Stocker Program is a three-step approach to keeping calves healthy and putting on pounds efficiently and economically while getting maximum benefit from forages. The first two steps feature Vita Charge® products that help promote feed and water intake and help boost the immune system during the first 14 days of receiving or weaning your calves. Step one includes Vita Charge Cattle Drench, which is administered within 48-hours of arrival. Then, the Vita Charge Stress Tubs should be put with calves for up to two weeks. Step three offers feeders one of four mineral options for calves to receive supplementation for at least 45 to 100 days. All three products are effective because of the Amaferm® advantage. Amaferm is a precision prebiotic designed to enhance digestibility by amplifying nutrient supply for maximum performance. It is research-proven to promote calf health and vigor and stimulate digestion and nutrient absorption of forage for optimum gain. Therefore, producers should see cost savings on their feed due to increased intake and absorption that comes from using the Gain Smart minerals. In addition to the savings in feed for the calves, perhaps the most important savings for the feeder will come in terms of health status of those cattle. Potential for savings exists in time and labor of treating the calves in addition to the medicines needed to treat sickness. Since up to 70-percent of immune cells are found within the digestive tract, it is vital to keep the gut healthy. If the gut is healthy, animals will be in better overall health and be able to better withstand any health challenges that come their way. “Antibiotics are known to kill the bad bugs, but consequently they kill the good bugs too. A product like Amaferm helps those good bugs get reestablished faster so an animal doesn’t miss a beat. Amaferm also helps enhance the impact in the digestive system if you must administer an antibiotic to treat a sick animal,” Grimes-Hall said. If you are not spending money treating sick calves and those calves are gaining more efficiently, just how much money are you making by being in the Gain Smart program? Research proves that cattle on Amaferm gain an additional .25 pounds per day, if you feed them 100 days, that is an additional 25 pounds of gain, and at current market value of $1.42/pound for 750-800 pound calves, that is an added value of $35.50 per calf. That doesn’t take into account the added health savings generated by Gain Smart of fail-out from natural or value-added programs. “With Gain Smart minerals with the Amaferm advantage, a stocker can accomplish many goals at once. They will stimulate gain since they are stimulating the calf’s rumen function. Healthy calves are more stress-free, which impacts immunity, and in the end, the stocker or backgrounder should see a significant return on his or her investment,” Grimes-Hall said. Yes, keeping your calves healthy and gaining is definitely worth the investment, especially if you want to market them in one of the many antibiotic-free or natural programs. Healthy calves putting on efficient pounds make dollars and sense.